I’ve started, erased and rewritten this piece three times now. 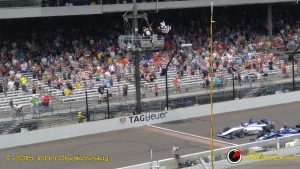 Three weeks after the 100th running of the Indianapolis 500 Mile Race, countless articles have been written about Alexander Rossi’s incredible win and the history he has made. That is a phenomenal story, no doubt. However, there’s a deeper tale that has parallels with my own rookie experience at The Brickyard. Much like the 2016 Indianapolis 500 Champion, I had an ace in the hole going into the month of May to insure not only a fun race weekend, but the experience of a lifetime. Every successful needs someone with knowledge and experience to provide strategy, adapt to changing situations and even a bit of cheer leading when things look bleak. Mike and I had Doug Patterson. 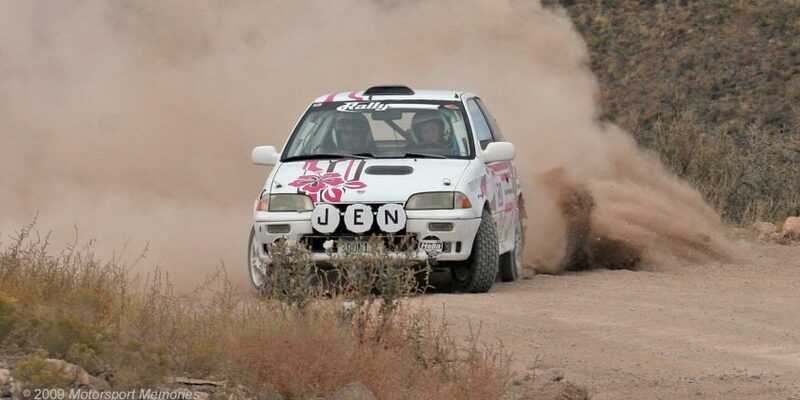 For any rookie, the key to a successful race weekend is preparation. For Rossi, I’m sure that meant simulator work and studying footage of previous races. For us, that meant getting tickets and access, and Doug provided the insight on where to get tickets (Stand J, Section 9, Row V) and suggested bronze badges. We splurged on the tickets through a broker, but they were definitely worth it. As the weekend approached, travel plans were made. After qualifying, with a week before time to leave, I tried to press Mr. Patterson for some schedule or details and was told he would make sure we were taken care of. Just as Bryan Herta had to reinforce that he had every angle covered for his driver. Being at a major event with a photographer means you do your thing while the photographer takes pictures. Despite this, our resident strategist made sure we knew where we needed to be. 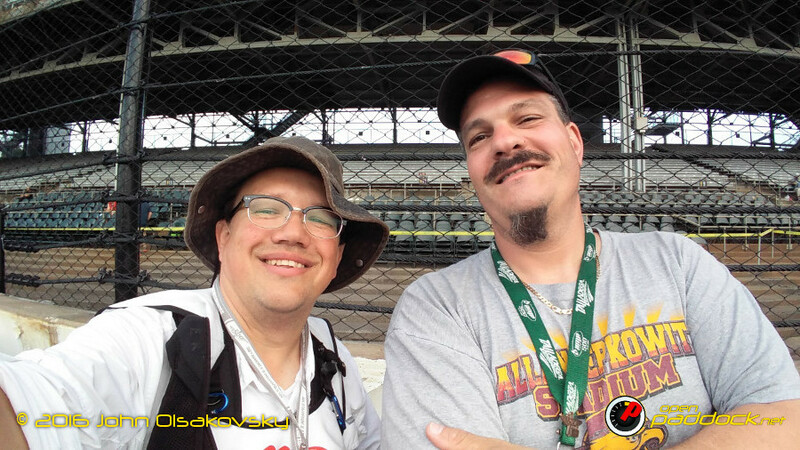 After soaking in as much as possible, we met up and found our way to seats on Pit Lane side, just past the yard of bricks. 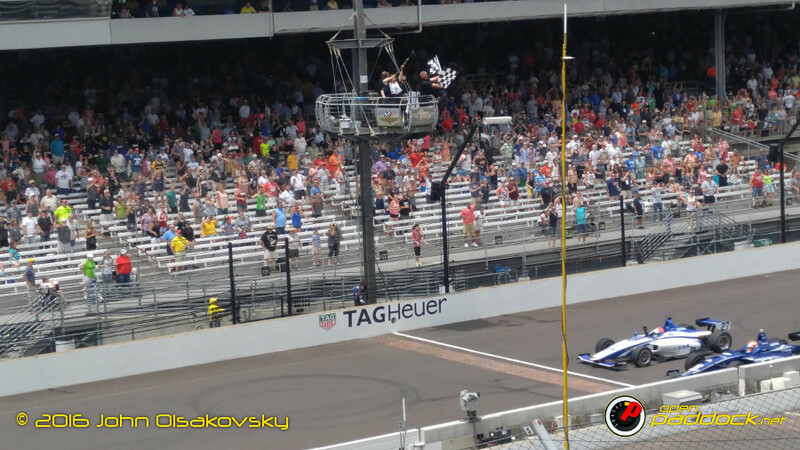 It was the perfect vantage point to watch Verizon IndyCar Series drivers in their final, frantic practice session as well as the incredible finish to the Freedom 100. I’m not a professional photographer, just a fan with a cellphone, and I was able to capture this image of a historic finish. The only reason I was able is because our strategist made sure we were where we needed to be when it counted. Bryan Herta made sure that Rossi was in the right place, qualifying in the middle of row four. In addition, Rossi out-qualified the rest of the rookies in the field, as well as every driver outside the Fast Nine, save one. Just like I couldn’t be in the right place to get that photograph, Rossi wouldn’t start in P11 without Herta’s coaching. In the evening before race day, we sipped Shiner as we discussed the plan. Mike would drive my rental car and meet with Shaun & Mike Whitesell at Speedway High School. I would drive in with Doug and his wife, with wheels up at 0400. Doug parks in the media lot, outside the main straight, but our coolers would be in his buddy Phil’s car since he had infield parking. This was logistical genius! By going in the wee hours, we hoped to get a similar photo of me in a pose similar to Kevin in a shot that Doug took three years ago. Just like in a race, situations change and adaptation is necessary. Just like Alex Rossi finding himself leading, but on a risky fuel strategy, we had our own challenges to overcome. First, the plan to shuffle me in on Doug’s media coattails was thwarted, as security was tighter than usual. Again, a minor setback, but it enabled me to get this incredible periscope as the bomb went off to open the gates for race day. And then, getting the shot we hoped for wasn’t happening, my experienced strategist had a plan. There’s some time between the gates opening and the opening of the gates to allow fans across the track near turn 1. Other than some yellow shirts, there weren’t many people around and Doug was able to get some great shots, for which I’m forever in his debt. He also posed for a selfie with me. Even after Mike and I connected and communication was spotty because of overloaded cell networks, Doug was the guiding hand to make sure we could get to Phil’s car, get our coolers and get to our seats in the stands. He kept us reassured, all while snapping photos of pre-race happenings. What’s worse, is the cars were not packed the way we intended. Our coolers were in Doug’s car, not Phil’s. Just like Rossi being told to make an impossible fuel number, we were reassured we’d get our drinks and it would be fine. Trust in your strategist is key. Rossi trusted and followed instructions. 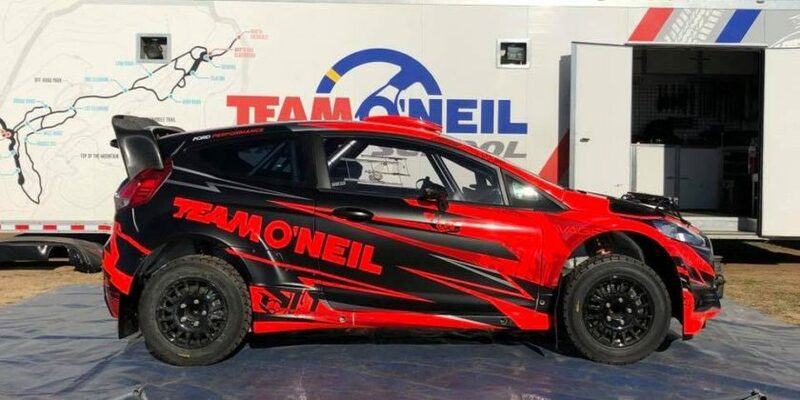 He lifted early and held in the clutch on the last few laps after getting a tow from teammate Townsend Bell. I’m sure that Alex thought he might run out of fuel and that this strategy would never work. When Mike and I were in an unmoving crowd somewhere behind Stand H, our grandstand in sight, yet inching our way forward at best, we worried that we might not enjoy the vodka and lemonade we had in the cooler. At that stage, a water was welcome, as it was hot and we were in the thick of it, quite literally. The strategy paid off, though. Doug came to our seats and we swapped coolers and enjoyed the pre-race ceremonies and a fantastic race. just like Herta’s gamble with an insane fuel mileage paid off to put a rookie in victory lane of the 100th Running of the Indianapolis 500. Mike and I enjoyed our beverages, especially the water, and a mind-blowing race. A historic race. A race that we could not have enjoyed to the degree that we did without the experience and patience of our mentor. We heard Alex Rossi thanking Bryan Herta on the radio. As I started on my thousand mile drive home, I had to make certain I thanked Doug. I couldn’t leave the state without expressing my appreciation for everything he did. 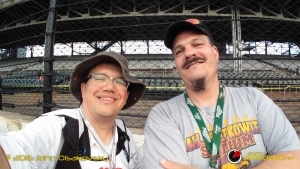 Not only did he share his experience of Indianapolis 500 weekend with a couple of rookies, he interrupted his job as a photographer (on assignment for a different outlet, no less!) to make sure we had the best time possible. Now, three weeks after that unbelievable weekend, the parallels diverge a bit. 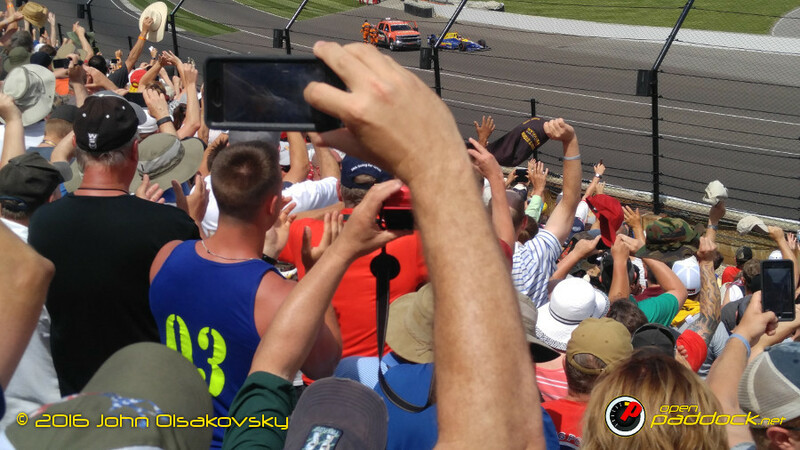 Alex Rossi has written a chapter in the history of the Indianapolis 500 and created opportunities that may change his destiny or alter his course to Formula One stardom. My destiny hasn’t been changed by a weekend in late May. I have, however, joined an exclusive group. While not prestigious, we are certainly honored to be considered friends with Doug Patterson. That’s far more sustaining than a quart of milk, most of which wound up dumped over Rossi’s head anyway.